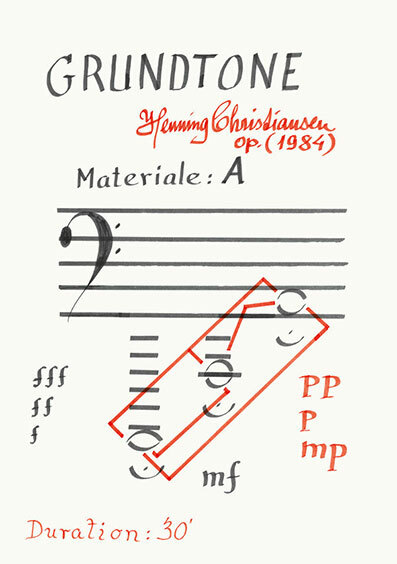 Henning Christiansen's handwritten score for 'Grundtone' [fundamental tone], opus 161 from 1984. Includes download code for Henning Christiansen's own recording of the piece. The prints come rolled in a cardboard tube with green HC stamp. The piece 'Grundtone' [fundamental tone] (op. 161) is of central importance in the oeuvre of Henning Christiansen. It marks both his return to the conceptual approach to composition reminiscent of his fluxus works of the early 1960es, but also establishes a link between his sheet music and his tape works. 'Grundtone' came to play a key role in both tape works, exhibition installations and his sound mixes for the performances – or actions as they preferred to call them – with fellow artist Bjørn Nørgaard, Ursula Reuter Christiansen and others. 'Grundtone' was written in 1984 – also known as "Green-Ear-Year" in Henning Christiansen terms – the year that Christiansen made his famous happening where he took over a barbershop for a day and painted a green ear on everyone that wanted one. The central gesture in the Green Ear is to listen to the world and all of its sounds differently – in short: as music. When Christiansen composed 'Grundtone', he wrote “to be played every day” in his journal next to the sketch for the composition. A sort of daily grounding or tuning of the ear. It is the same role of grounding or fundamental tonality that the recording of 'Grundtone' and the alternate version 'Udvidet Grundtone' [extended fundamental tone] (op.161b) from 1985, which was played in the several exhibitions – both by Henning Christiansens and his wife Ursula Reuter Christiansen – where it was used as a sort of background music or ambient sound.